What is a Level Walkthrough? A Level Walkthrough is a design document quite relevant to the current video game industry. These documents do just as their name suggests. Written by game designers and reviewed by the lead and level designers a level walkthrough is seeing through the players? eyes the level in both emotional and technical detail. These level walkthroughs are an important part of pre planning for many games. While level walkthroughs might not be needed for a puzzle game or a game that has no diverse levels It's mainly important for First Person shooters, Role-playing games, Strategic games that have many levels and even a side-scroller needs to plan out what comes onto the screen. A level Walkthrough gives the fellow teammates a clear view in what they?re making. A good level walkthrough will save much time and energy. Without a detailed walkthrough there could be a loss of continuity between the level designer, environment artist and the designer who takes care of scripted sequences. Mistakes could be made in the overall design of the level and parts would need to be reworked on or totally removed. So the reality of the matter is that Level Walkthroughs are indeed quite necessary and critical to the development of many games. They exist so there is as little reworking as possible. Better to get the job done right the first time then to coat it over a dozen times. For the purpose of this exercise I will do a level walkthrough Sample. That sample being a first person shooter type game. For the character of this level, let us use an existing character with existing confines and constraints. The reason for this is simple. If I make up my own character I can then give him powers and abilities to combat every situation he comes across, this is bad, as it doesn?t allow me to really think outside the box. Characters like this suffer from what I call 'superman? syndrome. For the character lets use MEGAMANX. MegamanX has a standard shooter weapon and upgrades he can use. He obtains extra weapon types each time he kills a level boss. He can jump up walls and dash to make a long jump. With upgrades he can double jump and can use a ?kill all enemies in the room? weapon. But he isn?t invincible by any means. Touching spikes instantly kill him as does falling down a bottomless pit. To start with he can?t take many hits form enemies and he's stunned for a spilt second when he's shot. While megamanX can become a very powerful character he always starts off rather weak. To keep in style well keep it a megamanX type level. Robotics and Futuristic setting. And those who play the original MegamanX games will remember that each level he goes to both serves a tactical purpose and looks quite different from the rest. 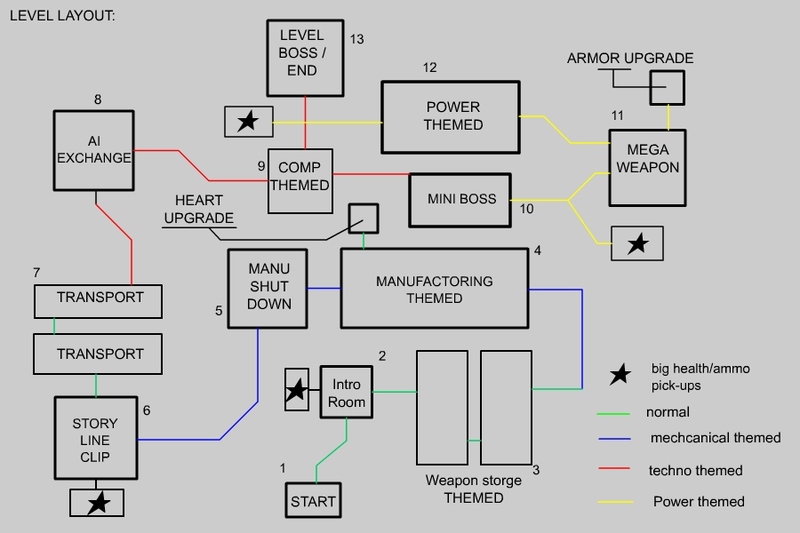 For this exercise well make the level a weapon manufacturing plant with a boss at the end of it. Before we type out a level walkthrough and more to the point before we even draw out a level design we have to decide what this level is going to present to the player in terms of rewards, obstacles, enemies and goals. We try to keep these things in continuity of the level. So if megamanX were in a weapons manufacturing plant then his goal would obviously be to ether suit down the plant or blow it up. Secondary objectives could range from maybe reversing the AI installed into the weapons so they wont fire at friendly targets and fire on enemies. [Which could change the outcome for later levels] Or maybe MegamanX can sabotage a big mega weapon being worked on. For my level design well say that MegamanX's primary objectives is to shut down the weapons plant, Replace the AI prototype mold so that all new weapons manufactured by the plant are defective and to proceed to the control room to take out the main boss so that the new manufacturing of the machines are unhindered and undetected until they are out on the battlefield. Secondary objective is to sabotage the secret mega-weapon being developed by placing explosive charges inside strategic points. Weapons: Many rooms can be weapon surplus and storage rooms. Weapon testing rooms and design rooms filled with computer screens with weapon schematics. Manufacturing: Some rooms and areas can have assembly lines showing the player the manufacture process of tanks and hand weapons. Rooms filled with parts still to be assembled and rooms filled with transport crates and hover trucks. Plant: Power plant to be more precise. The facility is self-contained and can do a variety of things. Therefore needing it's own power source. Capacitors and small generators are in almost all the rooms. And a few rooms are dedicated to power management and storage. Next we have to decide if this level is going to have any secrets or bonuses. In the megamanX series that's represented by obtaining two objects in a level. The health heart that gives megamanX a few extra points towards his health and an upgrade item. This can be in the form of a body part upgrade or a subtank, which stores heath to be used later like a med kit. Placing bonuses is more an art then anything as they have to be challenging to obtain but not imposable and the work that the player has to go to get this item must be balanced to the value. Therefore the heart upgrade is easer to get then the body part upgrade. As for enemies; MegamanX games are fun in this remark. The game starts with one intro level. But then the player has to pick from one of 8 levels, each level having a different theme and a different boss. So enemies for these 8 levels don?t really get harder from level to level. They pose a challenge to begin with but once you?re done playing and gathering the upgrades from all the levels you can run through the level with great ease, which is fun to do. Another consideration to make when designing a level and making a level walkthrough is the visual style the game is adopting. While not so much important in level game play design. How you place objects and all around aesthetic appreciation hinges on your knowledge to use the atmosphere of the art style to your best extent. Keep in mind though please. That as a junior many of the technical are probably handled by more experienced people such as planning out the advanced scripted sequences. The main point is to convey in your level walkthrough to what you believe the player experience will be like. Everyone's way of going about making a level design is different. Whatever works best for you is what you should use as long as it's somewhat understandable. The advantage of a level like this is that the buildings size and structure hasn?t been viewed form the outside. Therefore we really have no ?confining spaces? to design with. When you get this rare opportunity it's good to space out your level from a birds eye view. The reason for this is so that when the level designer is using his level editor he will have minimal overlap in the top view, which can be a pain and complication at times. For an inside FPS level a tried and true formula is to make a lot of rooms with a series of corridors connecting them. The rooms housing events, items of interest and intense shootouts while the corridors act as a passageway and maybe having stray enemies now and then. Corridors are also excellent for lifts and stairs. To give the level more 3D depth. But at this time we cannot see that clearly. Each room has it's own number. The reason for this will be shown later on in this document as I demonstrate the level walkthrough. You want detail in your document and you also want the design to be as easily readable as possible. If you?re making a map with many rooms and different themed places then going by room to room in numbers can be a godsend. The lines connecting the rooms are considered corridors. The reason behind colour coating them is if you want these corridors to look different instead of describing each connecting corridor just describe a corridor type and colour label them where you want them to be. On the diagram the name of the room ether relates to the style of room, an objective that can be fulfilled inside the room or an obtainable item. While this isn?t totally needed it helps to avoid confusion about where curtain stuff is. Now you the designer has an idea of what the level is shaping up to be. The rest of your team though only still has a vague idea. So it's time to write out the Level Walkthrough. Now it will always very from person to person and genre and other factors to like experience and training. But for me there are two critical features the level walkthrough must convey and communicate clearly to those who read it. 1) What does the player see? 2) What does the player do? There are other details you can include but remember not to go into ?over-detail? with your document. The person reading it should get maximum information for minimum effort on his part. That might sound like a cop-out to your work but lets assume everyone on your team is very busy. Do they have time to read 20 pages of document that conveys one level? These people are professionals. Give them enough info and they?ll fill in the small gaps. Give them too much or too little and trouble will ensure. For all corridors: All corridors for this level must be wide enough to support a walkway for two characters to pass at the same time at the same point, it's preferred that it be a little wider to accommodate details like placed static meshes. Unless stated otherwise lighting for the corridor is abundant and well lit. These corridors are clean and sleek looking. Minimal object placement in these corridors. Well lit and well maintained. Long lights connect to a metallic roof. Metal plates underneath and paneled walls make up the main detail of these corridors. The walls look futuristic like off some star trek ship with some more added glossy reflection. All in all detail is minimized, as the player hasn?t encountered the themed rooms yet. These corridors connect the manufacturing rooms mostly. Therefore they keep in theme and style. These corridors are slightly bigger then the normal ones. The walls are a mixed series of pipes and pistons. The lighting is slightly darker then well lit. The overall feel is a futuristic industrial tone. Dark colours and stream venting. Boxes and parts can be placed here and there to also act as cover for the player from enemies. The player should be feeling that while this is just a corridor, there is constant unrelenting movement about. These corridors connect the computer themed rooms mostly. Keeping in theme and style the ground has wires and cords running from one wall to the other wall in messes. The walls themselves are a flickering, beeping array of computer terminals, hubs and storage pillars. The equipment looks new but the lighting is low and the beeping lights are visible. The ground also littered with interfacing systems and computers left by worker robots. The player should feel that he knows he's hit the data center of the level when he enters these corridors. Yellow Corridors connect the power themed rooms mostly. These corridors are very tight and narrow. To both sides there are rigid power capacitors and generators with energy freely flowing through them. All protected by railings and barriers with multiple cautionary signs. These power units look sleek, the rooms are dark in light and there is hardly any mess. There is also nothing on the floor in way of objects. The player should feel that while he's just in a corridor, that there is a lot of power and energy around him. The humming of generators and the buzz of transformers. These rooms are depot areas. Storage rooms for miscellaneous parts and faulty weapons made in the weapons manufacturing plant. A small room with very little lighting, quite messy in appearance and up keep. An opposite to the clean and perfect nature of the rest of the facility. The player will consider these rooms as a recharge point in the level. As there will be abundant health and ammo pick-ups inside. These pick-ups take the shape of iconic floating shapes they should already be familiar with in previous levels. A small and hidden room that connects to the room labeled number 4. This room houses the Heart upgrade for the level. The room itself looks to be a smaller and more cramped version of the standard storage rooms. The heart upgrade in the middle of the room. Lighting is well lit and there are no enemies. This room is hidden by an invisible wall [non-solid BSB cut with texture] that can be revealed by using the ?X-ray cannon? weapon upgrade, which the player obtains in another level. Another small and hidden room. This time connecting to the room labeled 11. This room houses the ?Leg Armor Upgrade? for the game. The room itself looks to be like a small research room. The leg armor upgrade capsule has been plugged into half a dozen computer systems all-trying to analyze and decrypt the secrets that the capsule holds. The room is very well lit. The room is hidden, as there is a solid but cracked wall in-between this room and room 11. This wall can be blasted open by the 'super rocket arm? weapon upgrade, which the player obtains on another level. From start to finish each room has been set a different number. The reason for this is to create a more organized level walkthrough. When the level designer wants information in a curtain area he doesn?t need to sift through page after page of level walkthrough notes. With each room being numbered, he can cheek the diagram number. Then cross reference the document to find what he wants. The room megamanX teleports into at the start of the level. A small room that has no enemies to confront. This is the players? initial safe zone. The player sees a few monitors on some of the walls that have video of the factory making weapons and enemy robots. There is one door to exit out of. The room is well lit and there are only a few crates and boxes lying about. MegamanXs? base contacts him and tells him his objectives for the level. After that the player would make sense that there is nothing important to do here and move onto room 2. After the player exits the corridor he will come into this room. Visually the room is well lit with no shadowy areas. The appearance keeps in consistency to what the player has seen so far, that being a futuristic and clean styled configuration type. In this room there are a few crates and placed meshes to make the room look less sterile. A guard robot in the middle of the room and two other doors other then the one the player has just gone through, one leading to the pick-up room and the other leading to room 3. The player should enter this room as he's just started the level and herd the objectives. The guard robot is currently shutdown [asleep] and the player can ether shoot it or sneak past it both resulting in no detection. The player ether chooses to go straight to the 3rd room or make a detour to the pick-ups room to get some more ammo and health. These two rooms are quite large and high. The walls, ceiling and floor have the same texture and appearance of the first few rooms behind it with the exception of some wear and tear, a few scratches and dents in places and items. The room is dark and lit by many lights that emit a small radius only. As the name of the rooms states they are filled with creates, weapons, rifles and dormant battle robots. This area acting as a storage room. There is one other door apart from the one the player entered through and a big door that could fit a vehicle through that is locked. The rooms have a few lightly armed guards and patrol robots. The player will enter into the room and see many dozens of items and boxes. So much so that the exit cannot be clearly seen. The player can ether jump up on creates and get to the exit quicker but have to fight security drone and automated defense systems of the room. Or he can navigate the small simple mazes and only have to take on lighter robot guards. A lot of crates in this room are breakable and house a few ammo and health pick-ups, even a 1-up life hidden about. He?ll find these if he decides to explore the room more. If not he will easily get through and move into the next room. This room is rather large and high. Having a new tone of set design. This is where all the weapons and robots are manufactured. Large machines put together and weld these weapons on multiple assembly lines. Lighting is a little darker then well lit and in some areas lighting is darker then others. There are many small enemies in this room. None of them incredibly powerful but they are in numbers, some flying types and some run around the ground. Faulty manufactured weapons and robots scatter the floor and to the walls. The artistic tone of these rooms is a robotic, dark and mechanical assembly line. The player enters this room and sees that to get to the other side and to the end of the room he needs to use objects such as crates and other items to jump about and get on higher grounds like assembly lines. While he does this he must also contend with the enemy robots detecting and firing at him and the danger of the assembly line machines. If he times himself correctly though on the assembly lines he can avoid being hit by the machines. This room is basically some fast paced fancy footwork. Once he gets to the other end of the room he will see the door and continue onwards to the next room. Manufacturing command room ? Primary objective one: Shut down factory production. A medium sized room. The theme of this room is a futuristic command center. There are many control panels and monitors around the circular room. Cables and wires all over the floors and going into the ceiling. Well lit and very detailed in mesh placement. This room is supposed to come off as being quite important. On the monitor screens are manufacturing statistics and cross section designs of weapons. The room is guarded by 3 medium-armed robots that are alert and ready for megamanX. This room also houses the first primary objective and is represented by a control panel that fluxes a translucent green overlay. When the player enters the room the three robots in the center of it spring to life. The door behind him locks shut, as does the exiting door. ?Look! There's the intruder! Destroy him!? one robot shouts and they open fire. The player can maneuver and attack the enemies and protect himself by using objects placed around the room as cover. These three robots are a bit of trouble because there are simply three of them. So once the player destroys one the other two are relatively easy to take out. Once they are taken out the player will get a message from HQ telling him that the control panel to shut down the manufacturing is somewhere in the room. The player will find it. Press the action button to shut the plant down and complete the objective. He can then exit through the newly opened door that leads him into the level more. Data tracks room. ? Storyline Cut Scene: Seeds of war. A medium sized room. The theme of this room is that of data storage and large computers. The room is wall-to-wall with data storage tracks and tall imposing computers that exist to store information. The room is well lit and there are two other exits other then the one MegamanX comes in from. There are only a few lightly armed patrol robots and pose little threat to the player. The room is clean and it seems to be maintained very well. This room is mainly fabricated for purposes of a cut scene. The player enters into the room. He only needs to take a few steps inside before the view and HUD fades out and the cut scene for that room activates. The cut scene shows MegamanX walking through the data track room commenting how expansive Sigmas? [the main bad guy of this game] knowledge must be. He finds a computer terminal and starts to access it. To MegamanXs? horrified surprise, there are factories like this all over the world all waiting for Sigmas? command to strike the world with terror. MegamanX contacts HQ and downloads them the locations of these places so others can shut them down. With this done the cut scene ends and the player is returned control. He can ether exit to the next room or take a small detour to obtain some health and ammo pick-ups. Two large and long rooms. Outfitted with massive cranes and heavy item lifting and moving gear. Combat tanks and multiple transport trucks ready to take the weapons and robot warriors out into the world to curse havoc. The two rooms connected and having three large locked vehicle sized doors to which everything exits outside. The rooms light a little darker then well lit and having a messy scatter of fuel tanks, machinery and creates/weapons. Many enemies everywhere in concentrated groups and of different assortments. The overall theme is a fully working set of vehicle hangers. Dark and futuristic. The player enters the hanger and by the number of enemies he automatically knows he's going to get an intense fire-zone here. The door locks behind him, as does the one to advance onwards. The player has many objects to cover himself from enemy firing. And while he cannot drive vehicles he can blow up them up along with the enemy robots. So by keeping mobile and jumping form cover to cover and shooting at explosive objects he can take out the horde of robots easily with only his buster [default] weapon. If he has armor and weapon upgrades he might not even need to do that. After the fighting is over and the robots destroyed he can advance to the next room. Robot AI manufacturing/control room. -Primary Objective two : replace A.I. A medium sized room. Similar to room 5. This room is a circular structure with many control panels and monitors. This room being different to room 5, as it is a lot more crowded in terms of items and meshes. A.I control pillars all over the room. As again there are 3 medium armed enemy robots. Lighting for this room is intense and bright due to all the computer part manufacturing. The monitor screens showing schematics and data based on the AI being created. There is one door other then the one the player just entered through. One of the A.I control panels glows a translucent green to visually state that it's an objective. The player enters the room and the enemies see him quickly and start to attack. The door locks behind the player and traps him in until he has killed the enemies. Once the robots are destroyed the player moves over to the glowing console and uses the action to take out the factories A.I. chip and replace it with an A.I. of totally different properties. HQ calls megamanX to explain to him what this will do and the player can move onto the next room. A medium/small sized room but having three stories to it. Circular in shape and having a spiral staircase. The walls of the room cannot be seen as computer systems and hardware encase the room. Large power and data cables leading up to the center of the ceiling and a large mother computer in the center of the room. The room is well lit and is clean and well maintained in appearance. There are many small flying enemies that float around and patrol the room. Most of the computer hardware has flashing lights and make sci-fi noises. The player enters the room on the middle level. He can ether go upstairs or downstairs. Upstairs leads to the path to the secret weapon and downstairs leads to the path that goes directly to the boss and final room for the level. Enemies here are hard to hit due to flying but die easily and don?t have strong weapons. The player makes a choice on where he wants to go. Lets assume he goes upstairs to go and complete his secondary objective. Experimental weapon systems room 1 ? Mini Boss segment. A two story level medium sized room. Clean and pristine in appearance. The room is symmetrical in design and looks more advanced then the other rooms. Well lit and having no dark areas. The room is filled with many computers, Manufacturing equipment and the like. All of this used to make new and deadly prototype weapons and robots. In the center of the room a capsule holding the new weapon or robot in a dormant state. One door at the other end of the room other then the one the player walked through. The player walks in and after a few seconds the door behind him closes and an alarm is triggered off. Red flashing lights and siren sounds as the capsule in the center of the room vents steam, cracks open and the prototype robot bursts out and seeks it self to kill the intruder, that being the player. The prototype is a challenge to beat. Being fast and having a powerful buster weapon. It will require the player to do some strafing and combat. If the player has upgraded weapons it will be considerably easer for him to fight the prototype. Once he defeats and destroys the robot he is rewarded with some ammo and health pick-ups and can now advance to the next room. Experimental weapon system room2 ? Secondary objective. A three-story medium sized room. Again a clean and pristine room. This room houses the construction and design of a giant battle robot. This robot is so large that it's head and torso takes over three stories to house. Each story having walkways to access the robot as it's being constructed. Only the head, torso and left arm have been built, thus it poses no threat to the player. The rest of the room has an array of large robotic arms and tools to make the giant robot. There is one other door other then the on the player comes in from. Curtain parts of the robot glow indicating places where MegamanX will place charges to sabotage the robot. The player walks in and will instantly see the large robot. As it takes up 50% of the area of the room. There are only a few flying guard robots to take out. After destroying the guard robots HQ contacts megamanX and tells him that the giant robot is the secret weapon he was ordered to take out. The player moves up and down the three levels placing charges on the robot. After which he completes his Secondary objective and will move onto the next room. On the third level at a corner wall there is a crack. That's where the armor upgrade is. A large sized room but with only railings to walk on. The majority of space in this room is taken up by dozens of generators and capacitors. Huge power cables coming out of them and leading into spots in the roof. The roof a bundle of different going pipes with flowing pulsing energy. There is no real floor as the generators just keep going down until they can?t be seen. The lighting in this room is dark ironically. The light of pulsing power the only thing to keep it lit. There are multiple small flying enemies around the room. The player enters the room and from the power cords and machines knows where he is. The exit is on the other side of the room but not visible as power generators block the path. Darkly lit he can?t see everything but the railing is forgiving. All the player really needs to do here is follow the railing and take out the enemies that pop out here and there. This room is here to provide eye candy on the trip to the final boss. The player can exit the room without having to kill the enemies. The final room and housing the level boss. This room is medium sized and two storied. Being the main command room of the entire factory, it houses an array of computers, monitors and important data storage devices. Well lit and having a strategy table in the middle that shows holographic items. Everything looks shiny and new. Nothing looks beaten or scratched. The boss stands at the main controller. An eagle humanoid robot master. There is no other doors apart form the one that the player enters in from. And once entered he cannot exit until he defects the boss and teleports out. let's see if adding a reply bumps this back upto the top. Tron - I'm doing this for the same reason any design student allocates hours upon hors to a project. To add this to me game / level design folio. It's mainly theoretical if anything. Its main point is to show local developers that I'm capable to writing game design documents like this level walkthrough. And probably more relevant to them: A level Walkthrough using a licensed character with previous considerations and constraints. Doing a mock up level for this wouldn't be hard. But to make the level in the imagery to pass as a 3D megamanX FPS mod I’d need at least one programmer and 2-4 artists to create the content needed and an editor like UnrealED.. Which I have. So. It’s mainly just theory.